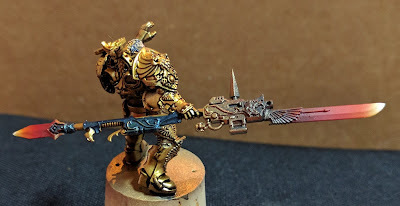 Whilst I was working on the Master of Mankind, I thought I would continue with my Custodes Tribune whilst the airbrush was out. 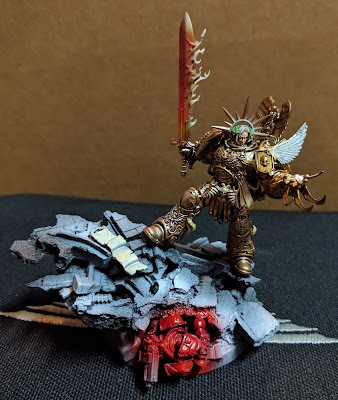 I wanted to make this blade stand out from the usual Custodian Spears, as the Tribune would carry a Paragon Spear and/or Valdor would carry the Apollonian Spear. So I made a red blend to make the blade appear as though it was burning hot. I also started working on the face, as I was batch painting faces, starting with the Emperor's face. Just thought I would show a quick WIP of the Master of Mankind. I have been blocking in colours and working out how I want things to look like. Essentially the base colour have been completed via the airbrush, and now I will have to go back in and paint the remaining details by hand. Just a quick pick of the primer coat (Stynylres Black) with Zenithal highlight of white (Vallejo Polyurethane White). I will show you a few close ups of the airbrush work as I progress, starting with the sword. This was done using successive layers of Vallejo Colors reds, oranges, yellows and a final highlight of aged white. I still have to go back in and reinforce some shadows, then pick out the flame highlights with more contrast. Hey Folks, have any of you had one of those situations where you're doing renovations that are projected to last six (6) weeks but actually drag out to six (6) months ? Well, that summarizes my hobby experience. The hobby room is still unavailable and with the goings on of 8th Ed. and 1st Ed. I just have been getting more and more excited to build and paint all the new shinnies. So today I cracked it and said, "enough is enough!" and began priming all the miniatures that I have been building and ferretting away waiting for the spray booth to come back online. In the end I set up the airbrush in the corner of the garage in 100degF+, around 38degC for you metric fellows, and primed over an old scrap of cardboard. 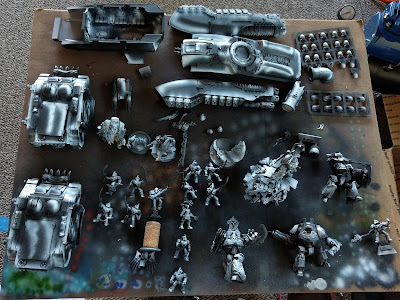 And look at all the shinnies I got primed. Starting with none other than my Master of Mankind conversion. Hvarl, which you've seen before, but with an improved head.